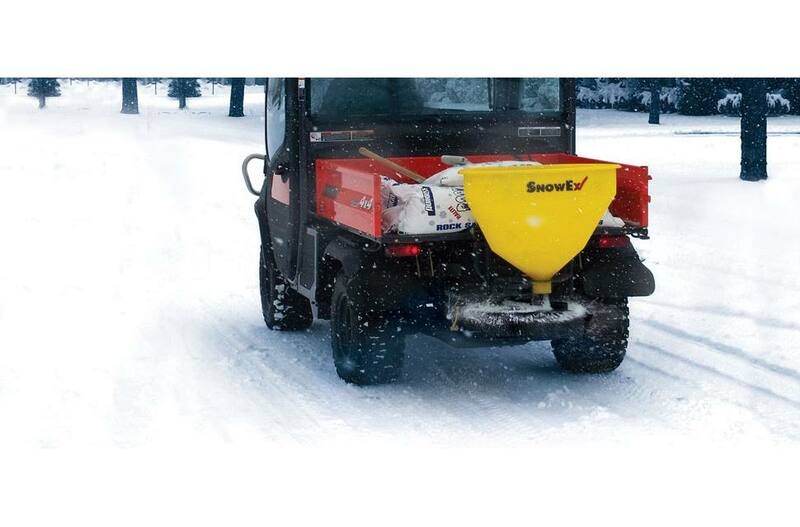 There's no need to run an electrical harness from the spreader to the cab when using the SnowEx® SR-210 wireless tailgate spreader. Designed to handle bagged rock salt, this plug-and-play unit features a vertical high-flow auger with patented spinner motor for rock solid performance. Wireless Controls : A pocket-sized, wireless key fob offers two spinner speed settings for easy operation. Vertical High-Flow Auger : Spread bagged rock salt accurately, thanks to the vertical high-flow auger. Spinner Motor : The spinner motor transmission is completely electric powered. It draws electricity from the vehicle and offers plenty of power to the spreader. Also, it's protected from the elements by a sealed drive enclosure. Receiver Mount: The spreaders come standard with a 2-inch (51mm) receiver mount for convenient attachment to a variety of vehicles. Weather Cover: Helps prevent moisture contamination in spreading material. Wireless Spreader Harness: Gives vehicles the ability to plug in the 7-pin connector of a wireless spreader. 3-Point Mount: Attach spreaders to the 3-point hitch of utility tractors. Trailer Mount: The Trailer Mount allows towing of select tailgate spreader models. Drop Utility Mount: The Drop Utility Mount is a low-profile mount for utility vehicles.